Rivalry exists in every work environment regardless of size, and whether it is planned or unplanned. Competition is often the root cause which has its benefits but also its challenges. On the one hand, it can push you to set bigger goals and keep learning new skills to stay ahead of the curve. It can also challenge you to find inspiration in new plays so you keep going instead of quitting. In the workplace, competition can get out of hand if not monitored. This can create unhealthy rivalries which can result in unethical, dangerous, or harmful behavior. Working with rivals can be difficult. It can raise your stress levels and even affect your productivity. It is not the end of the world though if you learn how to pick the right battles and always act with integrity. One of the benefits of working with your rivals is that they teach you about our own strengths and weaknesses. This information can use for your personal development and can even help you advance your career. This course shows participants how to work with their rivals successfully and why it can be the best decision they ever make. It also helps them understand that rivals don’t have to remain rivals. Even the toughest of them can be turned into partners or allies if you start with respect and work to common ground. At the end of the course, they’ll be able to put the different strategies and techniques they learn into action to achieve the benefits listed below. This Working With Rivals workshop is ideal for anyone who would like to gain a strong grasp and improve their Working With Rivals. The duration of this Working With Rivals workshop is 1 full day. Knowles Training Institute will also be able to contextualised this workshop according to different durations; 2 full days, 1 day, half day, 90 minutes and 60 minutes. Gain a sense of control. Work smarter instead of harder. Know how to identify your real rivals. Use different communication skills to find out the underlying cause of the rivalry. Identify the challenges of working with your rivals. Develop strategies for working with different types of rivals. Know how to turn a rival into a partner. Avoiding getting distracted by petty rivalries. Explain what a cooperative agreement is and how to write one that favors all parties. Cultivate strong allies to help improve relationships with your rival or to act as a buffer. Identify when the situation is getting out of hand and what to do. Find common ground with your rival to turn them into a partner or an ally. How to mend fences and fix broken relationships that resulted in a rivalry. Benefits and challenges of working with a rival. How to identify your rival. How to write a cooperative agreement. Benefits and challenges of a cooperative agreement. How to use the concept of a common enemy. How to encourage open-mindedness and emotional stability. Why you should cultivate strong relationships with allies. Know when to step back to cool rising tensions. There are 3 pricing options available for this Working With Rivals training course. Course participants not in Singapore may choose to sign up for our online Working With Rivals training course. 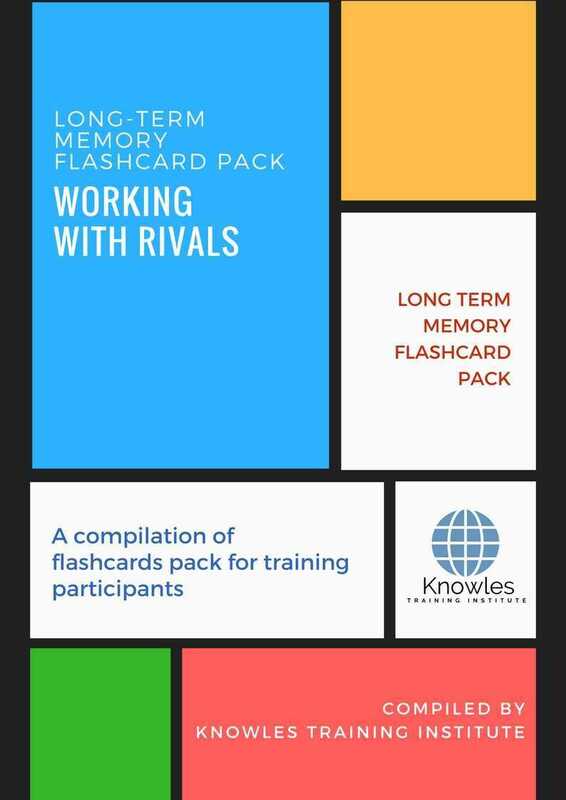 Request for this Working With Rivals course brochure. Fill up the short information below and we will send it to you right away! Register For This Working With Rivals Course Now! Share This Working With Rivals Training Course! Working With Rivals course, workshop, training, class, seminar, talk, program, programme, activity, lecture. Working With Rivals courses, workshops, classes, seminars, talks, programs, programmes, activities, lectures in Singapore. Working With Rivals improvement tips, Working With Rivals techniques, improve Working With Rivals, improve Working With Rivals games, Working With Rivals improvement exercises, improve Working With Rivals power, how to have good Working With Rivals, how to have good Working With Rivals in studying, how to build up your Working With Rivals, how to improve Working With Rivals how to improve Working With Rivals course in Singapore. Enhance, boost, build up, enlarge, heighten Working With Rivals course in Singapore. Increase, intensify, raise, reinforce, strengthen Working With Rivals. Upgrade, amplify, boom, elevate, exaggerate, magnify, grow, gain Working With Rivals. Develop Working With Rivals, multiple, power up, beef up, bolster, establish, extend Working With Rivals. Invigorate, restore, step up, toughen, empower, fortify, regenerate Working With Rivals. Rejuvenate, renew, escalate, expand, maximize Working With Rivals. Powerful, mighty, impressive, competent, great, excellent, exceptional Working With Rivals in Singapore. Superb Working With Rivals. Super, superior, strong, solid, active Working With Rivals training courses and workshops in Singapore. Working With Rivals enhancement, booster, building up, enlargement, heightening, increment, strengthening, amplification. Working With Rivals magnification, growth, development, power, empowerment, regeneration. Working With Rivals rejuvenation, development, escalation, expansion. Working With Rivals maximization, power training courses & workshops in Singapore.